Jamaica, the paradise island that is sometimes referred to as “the land of wood and water,” has great hydroelectric potential due primarily to its many rivers, land topography and climate. Out of a list of 120 rivers, the Island has several rivers that are suitable for hydroelectric power generation. Hydroelectric power is power generated from water. A basic hydroelectric power plant generates electricity in a three-stage process: First, water wheels are used to capture the kinetic energy (energy of motion) from falling or running water. 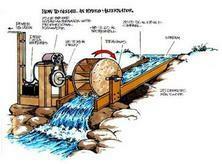 Next, this kinetic energy is converted into mechanical energy by a gear mechanism attached to the water wheel. Then finally, the mechanical energy is converted into electrical energy by an alternator that is connected to the gear mechanism. In April 2011, the JPSCo unveiled plans to undertake the first major hydroelectric development in Jamaica in 30 years. This involves the commissioning of a new plant that will further reduce the country’s oil import by 48,000 barrels of fuel per year. At an estimated price of $100 per barrel, this would save Jamaica US$4.8M annually. The new plant, which will see the doubling of the capacity at the Magotty Hydroelectric Plant, is scheduled for completion by July 2013. The Petroleum Corporation of Jamaica (PCJ) has shown through studies that Jamaica’s hydroelectric potential could be further exploited through the construction of a number of small-scale plants. The total technical potential is estimated to be in the range of more than 56 MW, including one large-scale facility at Back Rio Grande, as shown below. While the technical feasibility was proven in most cases, the economic assessment resulted in negative decisions in the past due to the high investment costs involved and comparatively low electricity generation costs from conventional plants. However, with the hike in oil prices (currently at US$99.87 per barrel) resulting in an increase in electricity generation costs, this picture is changing as can be seen from JPS’s recent decision to expand the capacity of the Maggoty Plant. Currently, the PCJ’s Centre of Excellence for Renewable Energy (CERE) division that has been mandated to support the implementation of new ideas and methods in renewable energy in Jamaica is pursuing several hydroelectric initiatives. The CERE has partnered with two international companies to update the technical, financial and economic feasibility study on five potential hydroelectric projects (listed below). CERE has partnered with BPR’s Power Division in four of the five projects and IT Power Ltd. in the other. BPR is a private engineering consulting firm located in Quebec, Canada, and IT Power Ltd. is a climate change consulting firm located in the United Kingdom. 1. The Back Rio Grande Hydropower Plant: Back Rio Grande is located in the parish of Portland at the north eastern end of the island. 2. The Great River Hydropower plant: Great River borders the parishes of St. James and Hanover, on the north western coast of the island. 3. The Laughlands Hydropower Plant: Laughlands Great River, a Greenfield site, is located in the parish of St. Ann, on the north coast of the island. 4. The Rio Grande (1 & 2) Hydropower Plants: Rio Grande is located in the parish of Portland at the north eastern end of the island. 5. The Swift River Hydropower Plant: Swift River is a tributary of the Rio Grande, located in the parish of Portland at the north eastern end of the island. These feasibility studies now open up the door for members of the private sector to step in and play a bigger role in leading the way forward towards the uses of cleaner, and cheaper sources of electricity. Private investors should, however, be aware that current legislation requires a license for all types of water uses, issued by the Water Resources Authority. The license is granted for a period of 5 years but can be extended thereafter. In competing situations, preference is given to fresh-water use over any energetic purposes. All environmental aspects have to be approved by the National Environment Protection Agency (NEPA). Thanks for the kind words! I surely appreciate you take the time out to leave a comment on the work that we have been doing. Hey! My name is Felicia and I personally just wanted to say your blog website is awesome! Anyways, I’m a big supporter of your blog website and if you at any time would like a guest write-up make sure you email. I absolutely adore writing! and piece of writing is actually fruitful designed for me, keep up posting such content. really like to get my hands on this theme! Kudos. The base theme I am using is Mistylook, which is readily available, however I made few tweaks here and there so you would not get the exact look. good luck! This blog details some fantastic nuggets of knowledge, so thank you for that! the same topics discussed here? I’d really like to be a part of community where I can get responses from other experienced individuals that share the same interest. If you have any suggestions, please let me know. Cheers! It’s actually a nice and useful piece of information. I’m happy that you shared this helpful info with us.